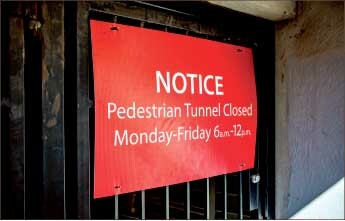 Liberty University’s Wards Road pedestrian tunnel has recently been closed Monday-Friday from 6 a.m.-noon due to commuters’ misuse of the tunnel as a way to enter campus. According to Chief of Liberty University Police Department (LUPD) Colonel Richard Hinkley, the pedestrian tunnel was constructed for the use and safety of resident on-campus students. Commuter students and Liberty employees are welcome to use the tunnel, but they must enter the tunnel from the campus side and reenter from the Wards Road side on the same day, Hinkley said. “The agreement with the property owner on the Wards Road side was very clear about the concern of commuters using the parking at the retail stores just to get to campus,” Hinkley said. For some commuter students like Brendan Smith, the tunnel is closed during his only break between classes on Tuesdays and Thursdays and is therefore an inconvenience to him. “I used to run off campus through the tunnel and get a meal at Panera or Chick-fil-A on Wards Road since most of the retail outlets on campus do not open until 11 a.m., with the exception of Dunkin’ Donuts and SubConnection in DeMoss (Hall),” Smith said. He added that his thoughts echo how many of his friends are also feeling. LUPD has listened to the concerns of students and is currently working on a different method of access. Originally the pedestrian tunnel was closed from 6 a.m.-2 p.m., but after the response from on-campus students saying that they would like the tunnel opened earlier, the tunnel is now opened two hours earlier. According to Hinkley, students who want to go off campus without driving their cars during the hours that the tunnel is closed may consider taking the bus or walking to the traffic tunnel. “Improved pedestrian access, (which includes) crosswalks and pedestrian lights at the Harvard Street crossing, is being worked on by the city of Lynchburg,” Hinkley said. Thus far, only one retailer on Wards Road has voiced concern over sales, Hinkley said. “(The concern was) more of an issue with people taking up their parking and not being a customer,” Hinkley said. The pedestrian tunnel will be closed during the posted hours only temporarily until a turnstile gate is installed. According to Hinkley, this will prevent students from allowing unauthorized persons from entering with them when they use their student IDs. BUNNER is a news reporter. Why not just deal with the violates on a case by case basis instead of a blanket one policy fits all approach? It’s absurd that the use of the tunnel should have restricted access at all. Anyone should be allowed to use the tunnel with or without a ID card to access it. Or perhaps we should install turn gates at every entrance to campus, I’m sure we can all see the irony in calling a university Liberty when none is offered.